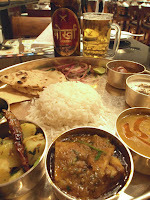 Last night I enjoyed a splendid Nepali Thali in the hotel, washed down with an ice-cold bottle of Gorkha beer. After a long day of continuous meetings without food, I deserved another Thali. I hosed off the city dirt in a wonderfully hot and ferocious shower, donned fresh-smelling clothes and grabbed a few moments of un-planned sleep before tackling the tiny dishes of daal, chicken curry, vegetables, papadum, chapatti, raita and sweet dumpling.